If you want to programmatically add code blocks to the document you should use the InsertCodeBlock() method of RadRichTextBox or RadDocumentEditor. These methods accept a code fragment as a string and code settings which specify the formatting of the code block. More about annotations you can learn in the respective help article here. Inside each RadDocument there is an instance of the CodeFromatter class which is used for formatting code blocks and is also an extensibility point for adding code languages. It is available through the CodeFormatter property of the RadDocument. The default taggers are based on regular expressions, which come particularly handy in such scenarios. If you would like to implement a custom tagger for an already added language or a new one, you can do so by registering an instance of RegexTagger in the Code formatter. You can also implement you custom tagger by deriving from TaggerBase. With the second approach you have full control over the implementation and you may base your implementation on a mechanism different from regular expressions. 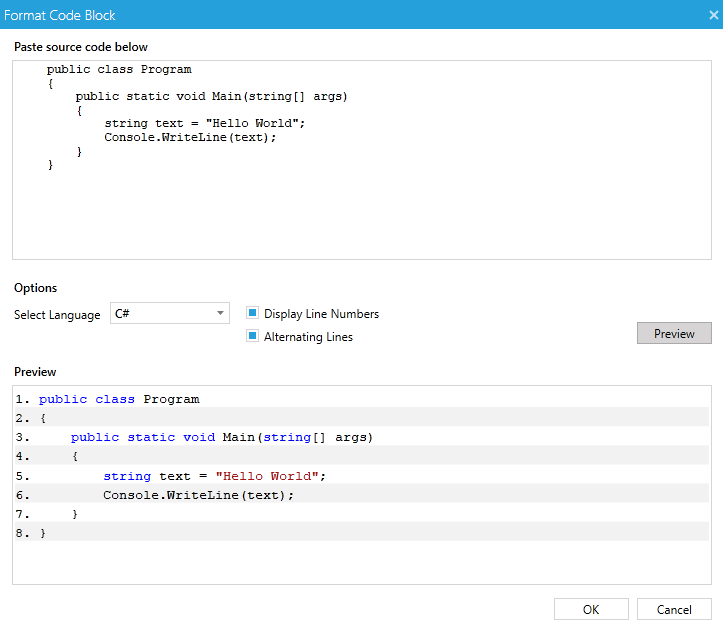 Once you register a tagger for a new language, the language will be visible in the InsertCodeBlock dialog. You can download a runnable project showing how to add custom code formatting language from our online SDK repository here, the example is listed as RadRichTextBox / CustomCodeFormattingLanguage.